Ever wonder how certain things came about or were invented? I do! All. The. Time. Especially food! (BTW I love the Food Network Show Unwrapped!) Well the article below, that I wrote for meal planning/recipe site Food on the Table, is all about some popular American food. So this 4th of July weekend impress your friends and family when you bust out these fun food facts (say that three times fast) while you serve these burgers, S’more cookies, or even the All American BBQ Chili Dogs shared below! From sea to shining sea, there are some foods that ‘sing’ America! To celebrate the upcoming Independence Day holiday why not host an all American dinner party with a menu full of popular foods that have helped build our beloved Nation. Hamburgers: There is great debate about where the All-American hamburger got its start. Some say that a New Haven, Connecticut restaurant owner in the early 1900’s had a customer in a hurry and needed lunch fast. So he slapped a beef patty between two slices of bread and served up the first “hamburger”. But to people from the south, the hamburger was invented long before then, in the late 1800’s in Athens, Texas. Debate or not, hamburgers are an inexpensive, easy to make meal, that make them one popular American food! S’mores: It is uncertain where this classic, delightful campfire treat originated; but the very first printed S’more ‘recipe’ is found in a 1927 Girl Scout camping manual. The original name of this gooey treat was actually “Some More” because of the constant requests for more. The name was later abbreviated to “S’more” perhaps because of the difficulty to say ‘some more’ with a mouth full of sticky marshmallows! Chili Dog: Serving sausage in a bun is a meal known around the world. Germans are known to be the first to enjoy this simple meal back in the 13th century. 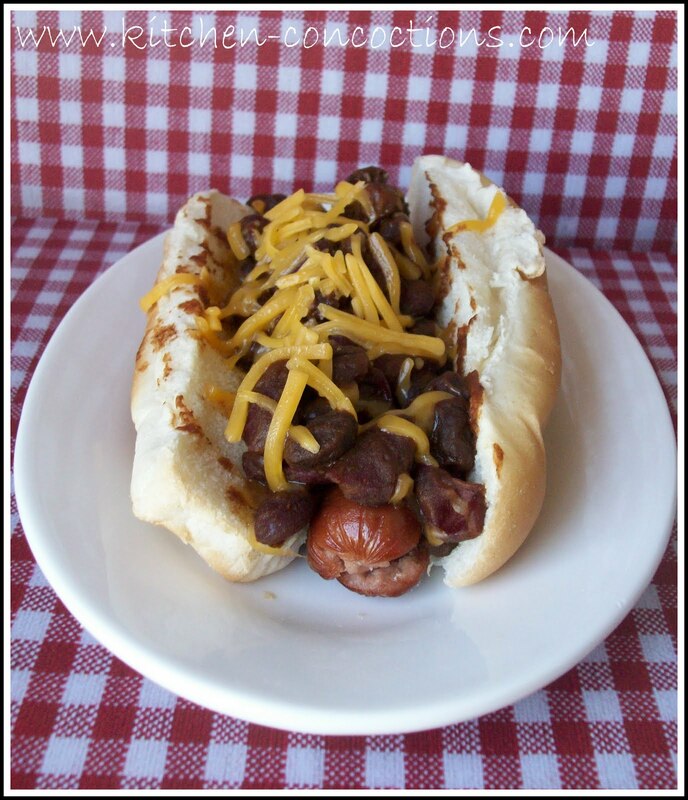 However, the chili dog, also known as a Coney Island hot dog, came about in 1914 in Jackson, Michigan. The original “Coney Island Dog,” which actually has little association with the Coney Island of New York; was a grilled hot dog served with a beanless chili, cheese, yellow mustard and chopped onions. Today Americans near and far enjoy this hands on meal at sporting events, BBQ’s and more! Other great “All American” foods to serve up this 4th of July include Philly Cheesesteak Sandwich, Corn Dogs, Buffalo Wings, Peach Pie, grilled corn on the cob and potato salad. 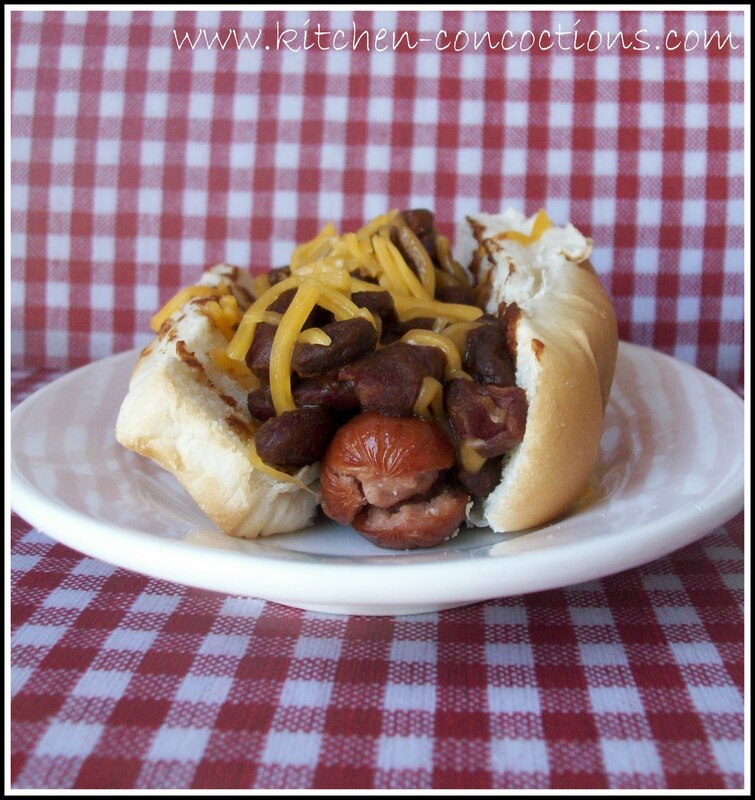 Try this flavorful recipe for an All American BBQ Chili Dog at your next gathering! In a large saucepan over low heat, heat olive oil, add onions and cook until translucent, about 5 minutes. Stir in the barbeque sauce, beans, chili seasoning, brown sugar, Worcestershire sauce, ketchup, apple cider vinegar and mustard. Bring to a boil and reduce heat to a simmer and cook for 10 minutes, stirring occasionally. Meanwhile, set up grill for direct cooking over medium heat. When ready, place hot dogs on the grill. Cook for 10 minutes or until heated through, turning occasionally. Add buns to grill and toast. Place hot dogs in buns and top with chili and cheddar cheese. A great recipe for this weekend! Thanks for sharing!